Stephen Riley Photography: Somerset: If your burger moos, it’s undercooked! If your burger moos, it’s undercooked! No great shakes on the photography front, this – just a phone-cam shot, taken for my own entertainment in Germany a little while ago. 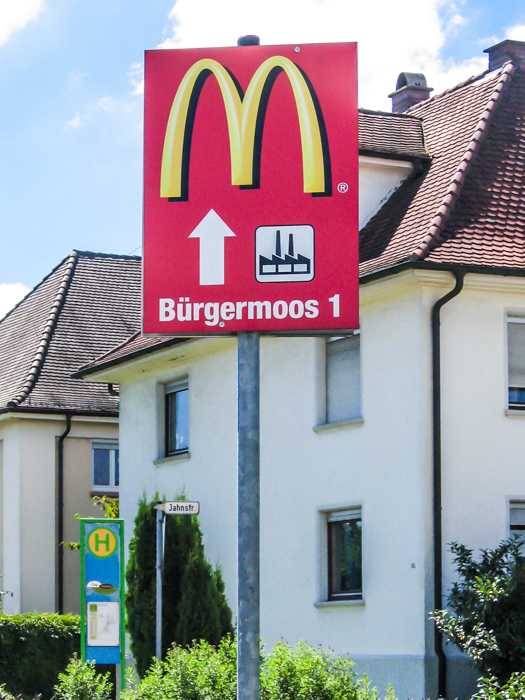 Burgermoos (it should have an umlaut over the u, as can be seen on the photograph, but I can’t work out how to do that on this keyboard) is a small industrial area attached to the town of Tettnang, near Lake Constance in southern Germany. Putting it on this site now, in the midst of a damp Somerset winter, it is a pleasing, if wistful, reminder of summers spent in warmer climes.